Makwan Amirkhani’s eight-second flying knee knockout of Andy Ogle at January’s historic stadium show in Stockholm shot ‘Mr. Finland’ into the hearts of UFC fans worldwide. 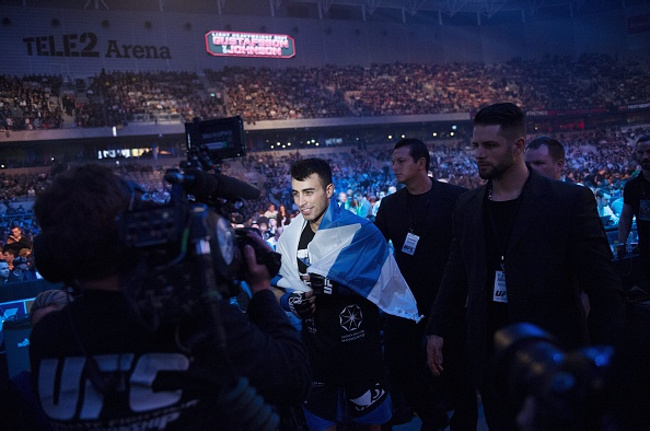 Winning a ‘Performance of the Night’ bonus, Amirkhani discussed becoming an overnight sensation, especially in his home country, Finland. “I went into the fight thinking ‘I have to win this fight.’ Even though I was training with (Alexander) Gustafsson before the fight, I felt like he was a superstar and I was way behind,” he explained. And the flying Finn is not tiring of the limelight either. In fact, the featherweight doesn’t seem to understand people who are in a similar line of work that shy way from their media commitments. As for any pressure he feels going in to his next fight having banked such a memorable finish in his first UFC outing, the Allstars fighter insisted that he doesn’t really care about the outcome of the bout. Amirkhani only recently made the shift to full time MMA having spent a long time isolating his training to wrestling. Now, with his full focus on MMA, ‘Mr. Finland is aspiring to get to the same level as Jon Jones in terms of unpredictability and shot variation. “My arsenal is just growing. Everyday I learn something new and that makes me want to train even more. I think sometimes I can train too hard, I need to take more time to recover. We’ve been doing a lot of sparring and I’ve been adding a lot of techniques that work for me. “I want to get to the same level as Jon Jones—you don’t know where he is and you don’t know what he’s doing to do next. I like elbows, knee—everything,” he outlined from Krakow. When asked about a time frame on his next trip to the Octagon, Amirkhani claimed that undefeated Chilean fighter Diego Rivas turned down a fight with him because “he was afraid”. “I don’t have a fight coming up, but there was this guy from Chile and he didn’t want to have a fight with me and he said to UFC that he was injured. I think he just doesn’t want to fight me because if the UFC came to me with a fight I would take it with a broken arm. “I don’t know why he didn’t take this, it was a huge opportunity and the fight was three months away so I don’t understand. The only reason I think that he would do that is because he was afraid. Appearing on Ariel Helwani’s The MMA Hour in January, Amirkhani revealed that he had only watched one UFC fight card, UFC Fight Night: McGregor vs Siver, before his promotional debut. Now in guest fighter role in Krakow, the featherweight confessed that he didn’t know who Gabriel Gonzaga was when he saw him at the event, but to his credit, he did know some things about Mirko ‘Cro-Cop’ Filipovic. “It hasn’t changed I still don’t watch it. Yesterday I was watching a thing with ‘Jojo’ (Joanne Calderwood) at training and there was this guy, this big guy, and I asked her who it was. Then she told me that it was ‘Gonzaga’. She couldn’t believe that I didn’t know him, but now I know. “I think I have seen a few fights of Mirko Cro-Cop. I think he fought against...who was that Russian fighter? Fedor, that was the guy,” he remembers. Finally, Amirkhani gave his take on what will happen when Jose Aldo meets Conor McGregor on July 11 to decide the champion of his weight class. “Aldo. He will win with a unanimous decision. I don’t think I could beat Aldo, not yet, but Conor—yes,” he finished.